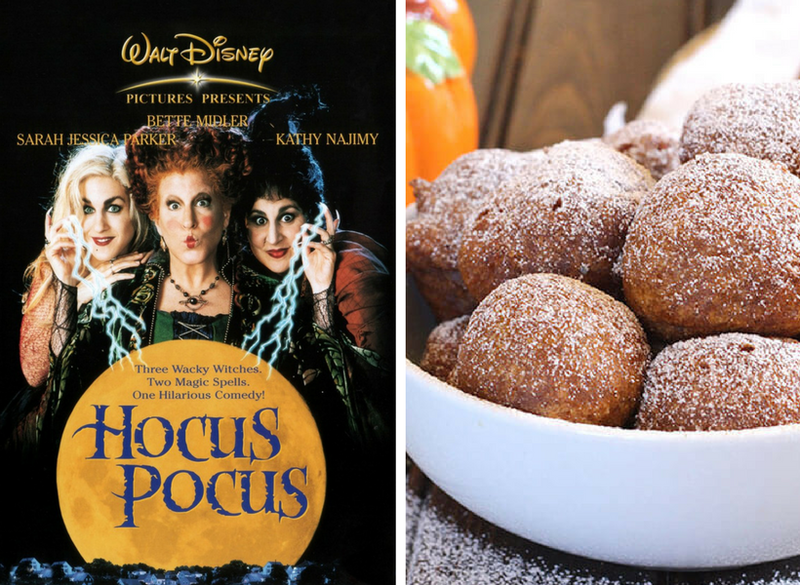 Virtual Halloween Movie Party: Bloggers Share Recipe + Flick Faves! This was such a fun round-up! I love movies. I love food. I love Halloween. So put all those things together and you get this! 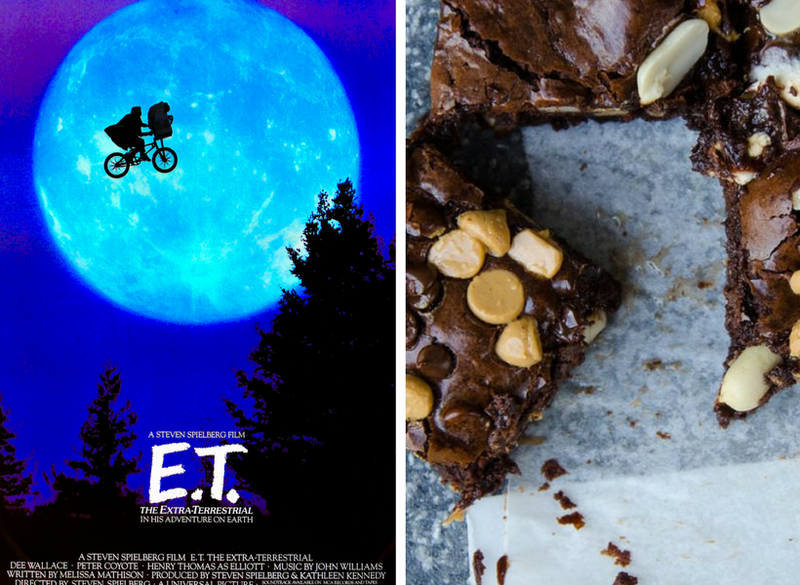 One big Virtual Halloween Movie Party, with recipes. 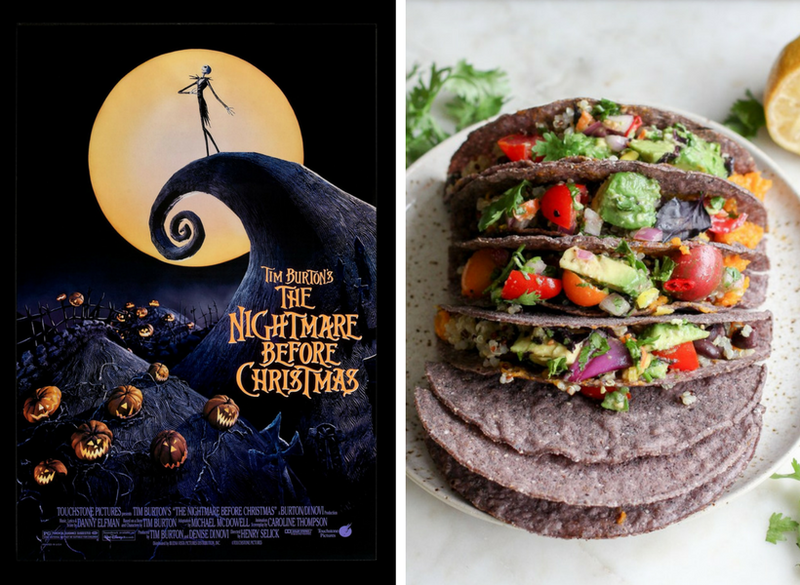 I asked some of the FindingVegan bloggers what their favorite Halloween movies were, and what recipe they would pair their movie watching with. Here are their answers and the top three most-mentioned movies! Boy do I have a lot of movie watching catch-up to do after compiling this list!.. 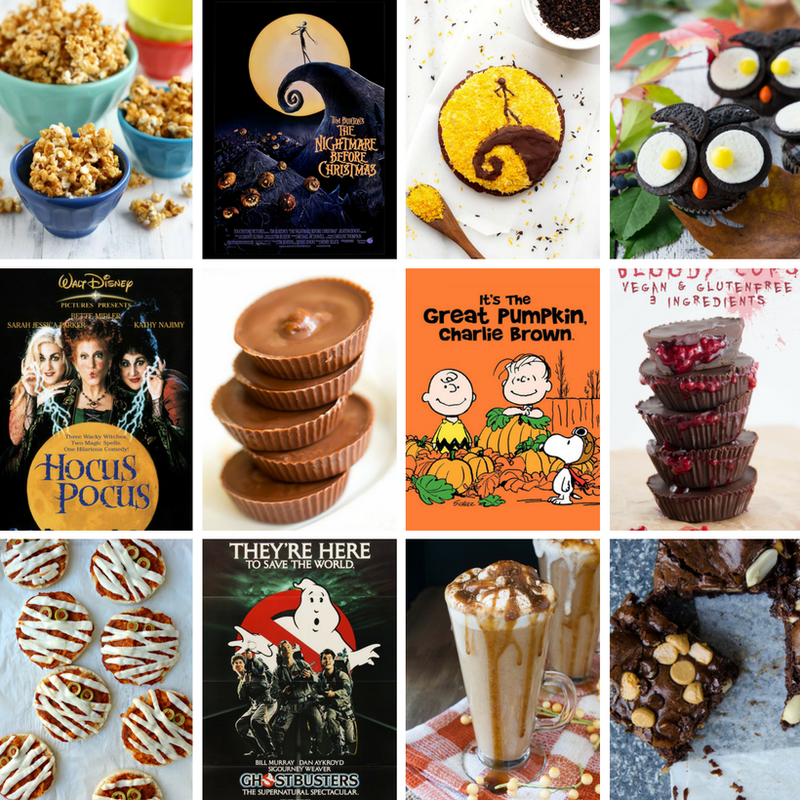 24 Favorite Halloween Movies from Bloggers + Recipes! 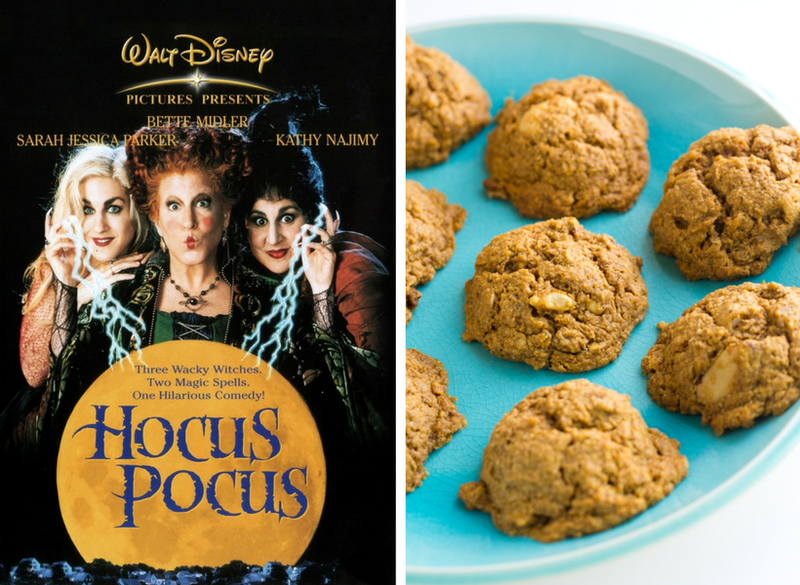 Rebecca from Strength and Sunshine loves Halloween paired with these, grain-free soft Pumpkin Spice Latte Cookies! 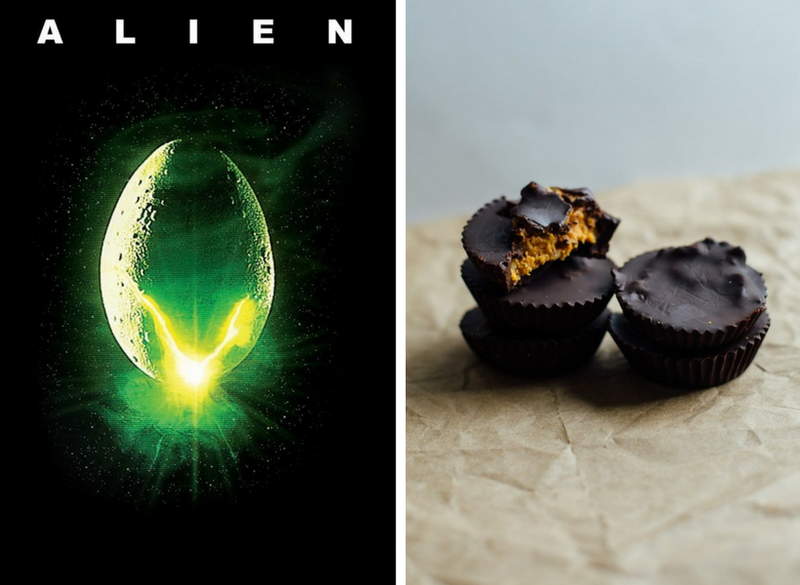 Sarah from SoyDivision says, "My favourite Halloween movie is 'Alien'. That chest burster scene!!" Paired with these Pumpkin Peanut Butter Cups. 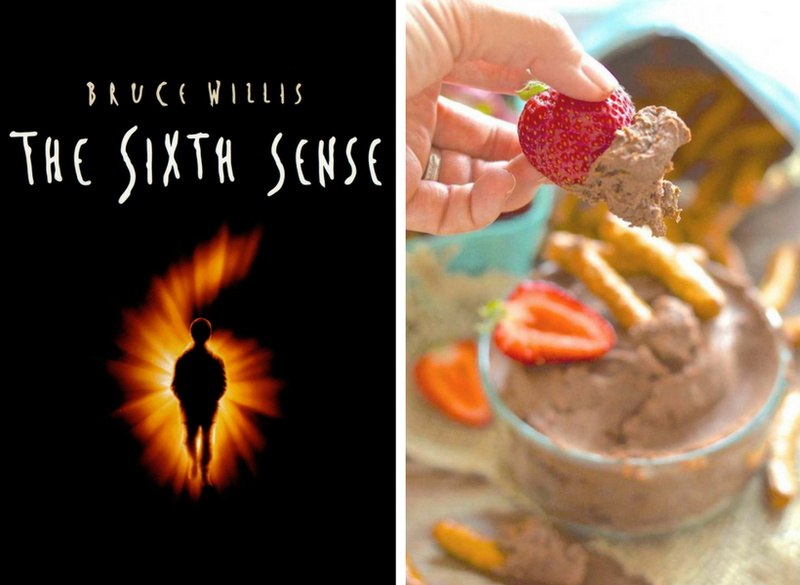 Melanie from A Virtual Vegan says, "My movie of choice would the "The Sixth Sense" with Bruce Willis. Love that film! 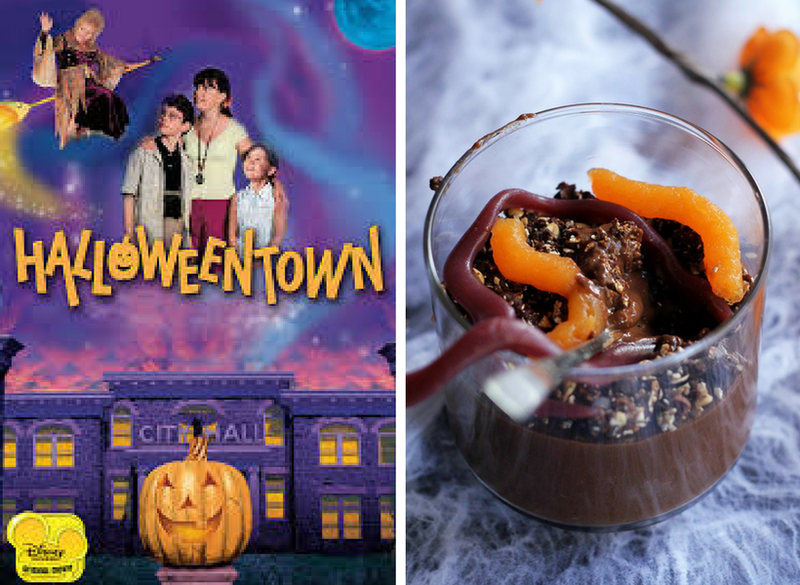 Brownie Batter Dessert Hummus would be my accompaniment." 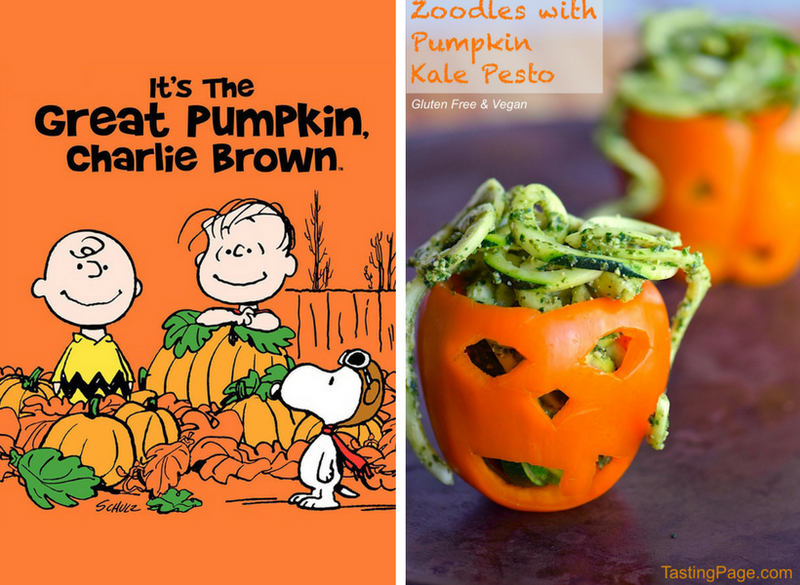 Sophia from Veggies Don't Bite says, "It's the Great Pumpkin Charlie Brown!!" (Can you tell I have kids 😂) While cuddling up and sipping these Hot Pumpkin Spice Drinks with Caramel." 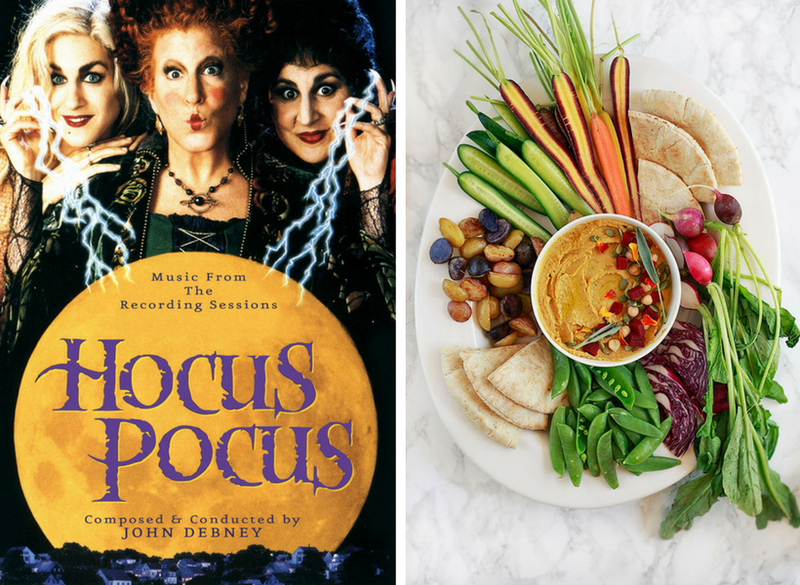 Amy from Veggies Save the Day says, "I love Hocus Pocus! I will serve my mummy pizzas!" 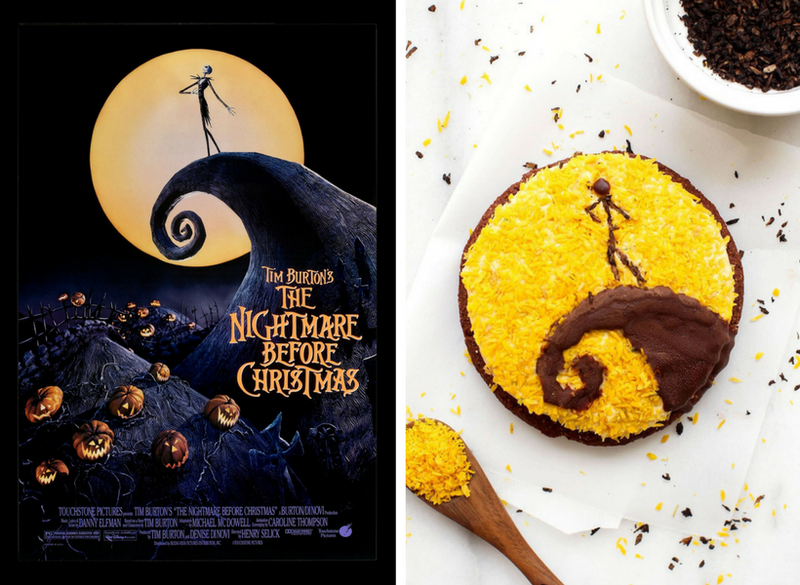 Natalie from Feasting on Fruit says, The Nightmare Before Christmas with these movie-themed cookies! 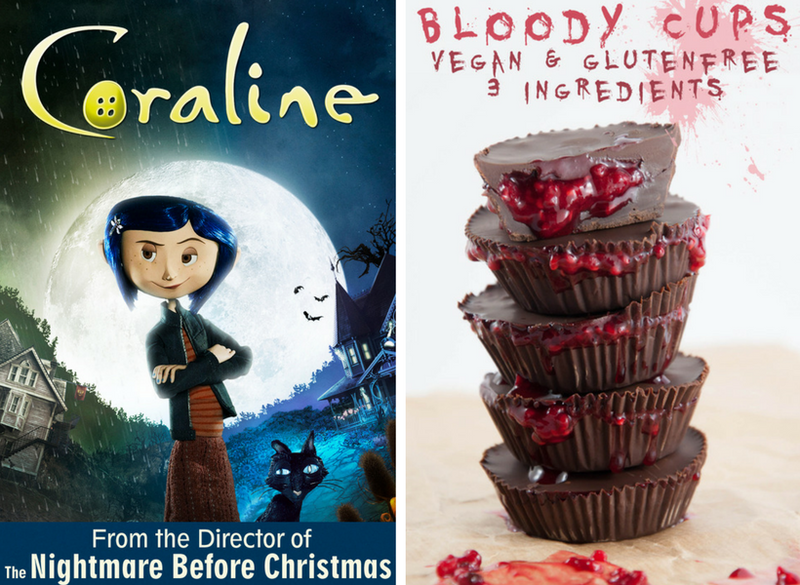 Bianca from Elephantastic Vegan says, "I'm not big on horror movies, but I really liked "Coraline" - it's got a dark vibe." Serve with these Bloody Halloween Cups! Casey from Two City Vegans says, "Pan's Labyrinth! Heartbreaking, beautiful, and eerie. 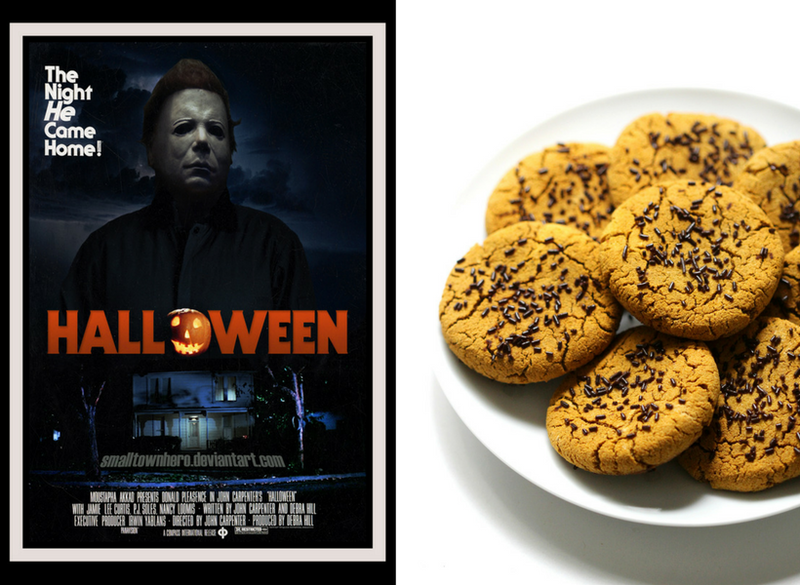 I'd serve Chocolate Pumpkin Cookies." 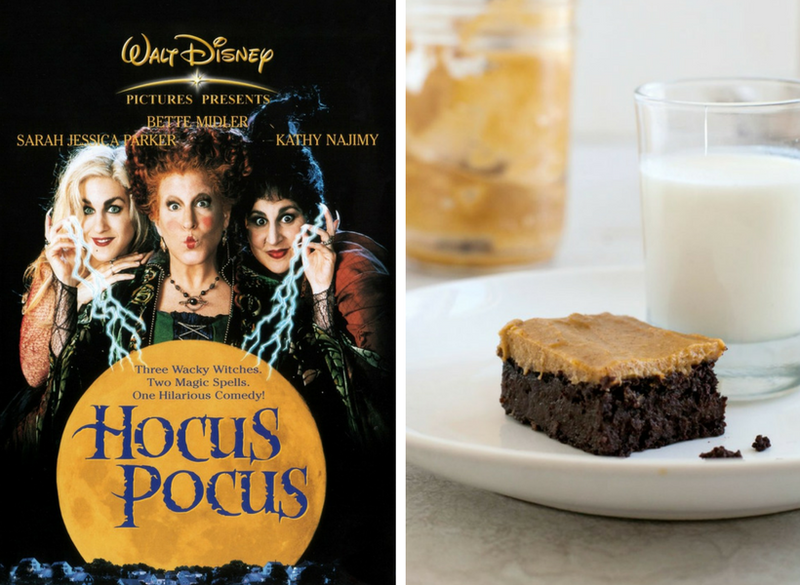 Sarah from Vegan Chickpea says, "Ahhh I love Hocus Pocus too!! 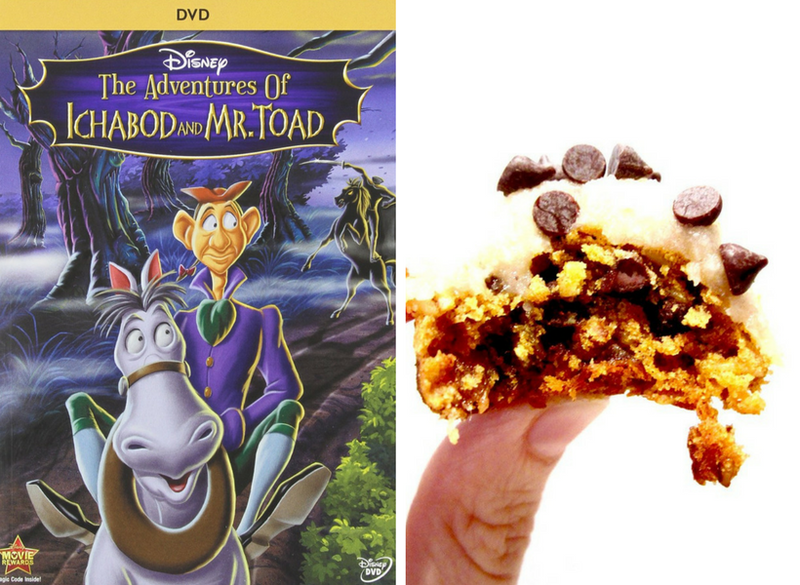 But to be different I'll go nostalgic with a kid friendly movie - The Legend of Sleepy Hollow (Disney)" Served with her Pumpkin Chocolate Chip Muffin Top Cookies with frosting. 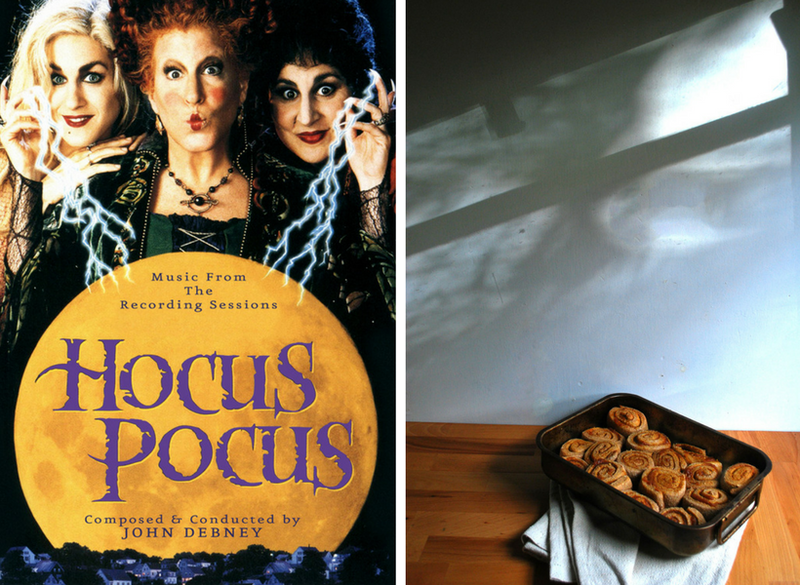 Sara from The Organic Dietitian says, "I don't do scary so Hocus Pocus!" 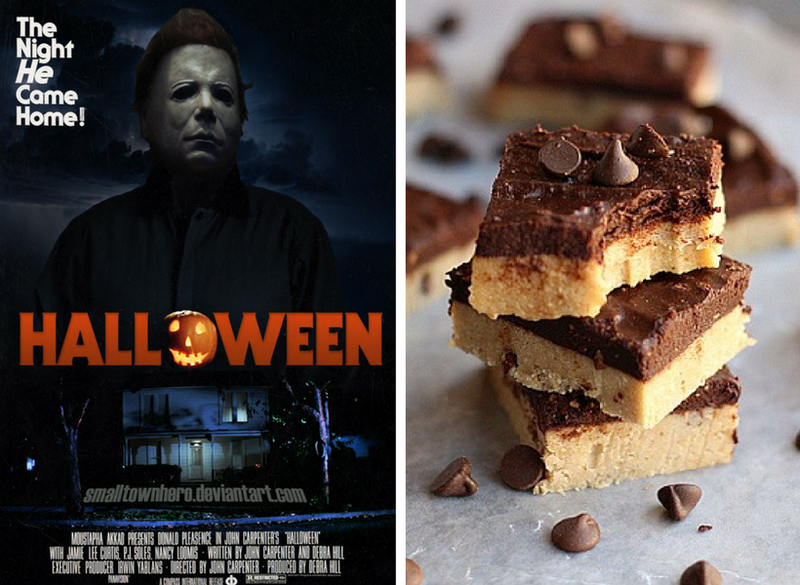 Paired with these yummy Fudgy Double Pumpkin Brownies. 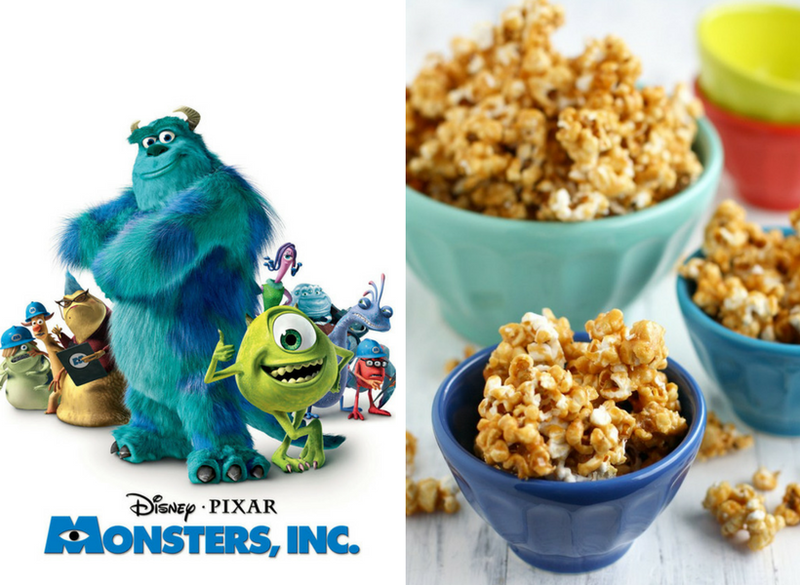 Kelly from The Pretty Bee says, "Monsters Inc. is one of my favorites! It's more funny than scary, so good for the kiddos. Served with vegan Caramel Corn." Sus from Rough Measures says Hocus Pocus paired with Pumpkin Swirls with maple tahini drizzle. Leah from Love Me Feed Me says, "I want to go to this halloween party! Halloweentown series!!" Paired with these Chocolate Worm Pudding Cups! Jennifer from Veggie Inspired Journey says, "Not necessarily a Halloween movie, but I love The Shining. 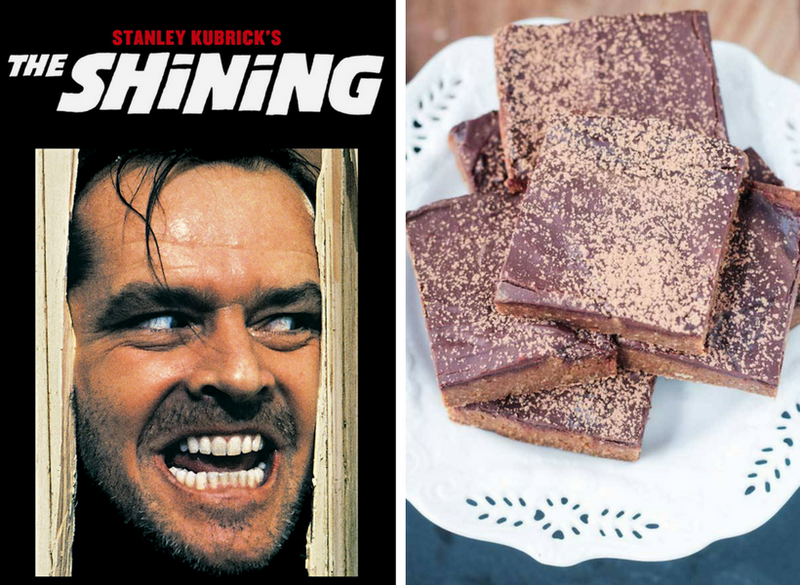 And I'll have some Pumpkin Fudge Brownies to keep me company." 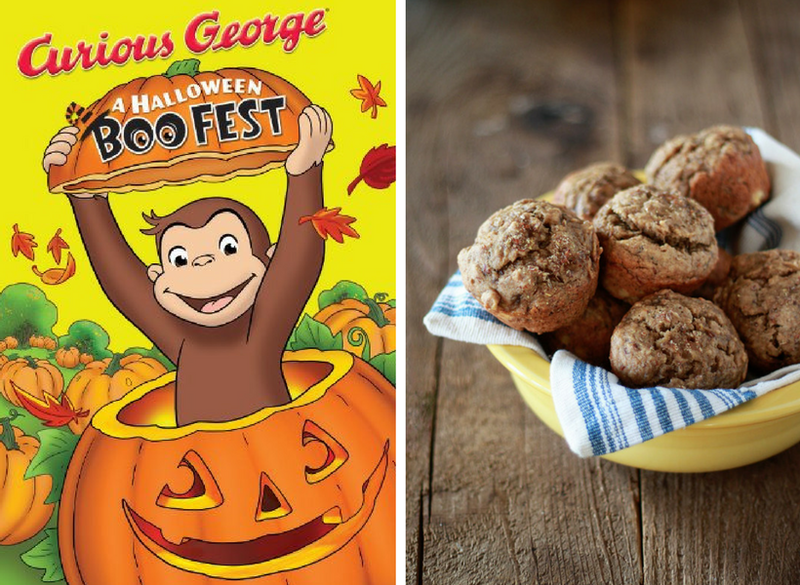 Karen from Kitchen Treaty says, "Preschooler in the house here ... gotta go with Curious George: A Halloween Boo Fest and these banana bread muffins." 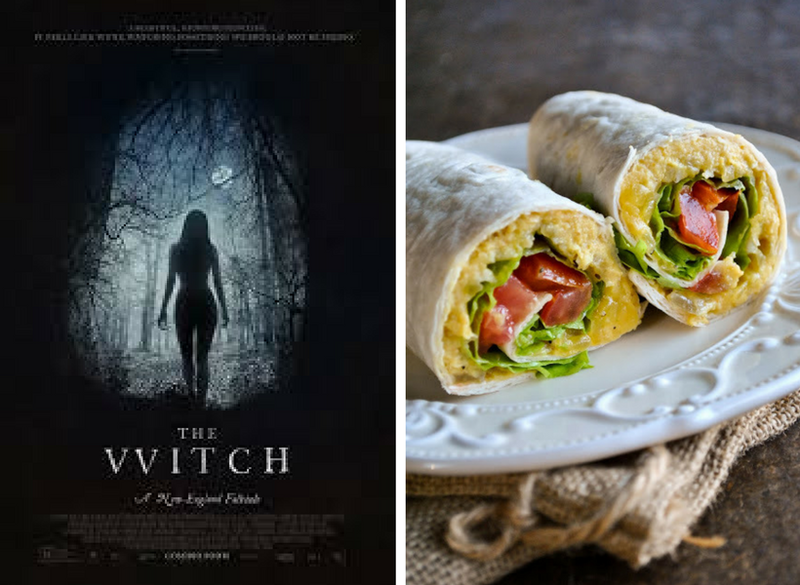 Sandra from Vegan Sandra says, "We would watch "The Witch" (2015) and eat these delicious pumpkin and hummus wraps." 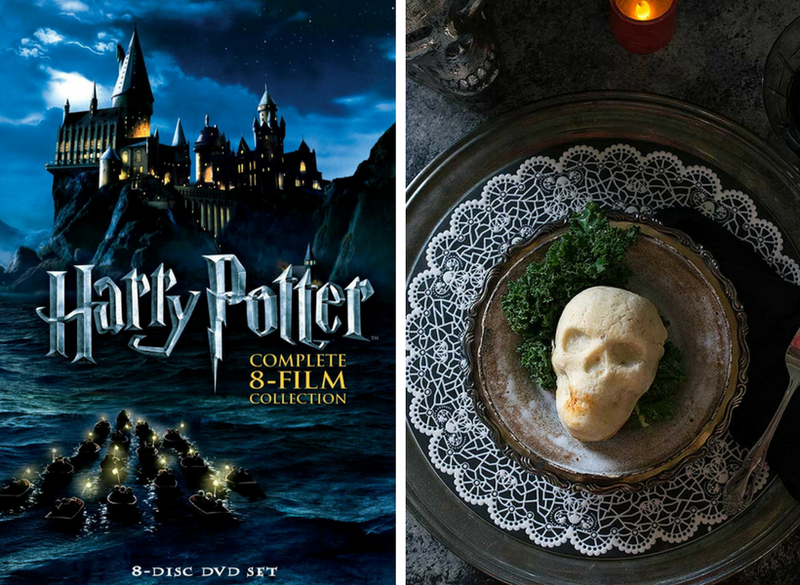 Kathy from Healthy Slow Cooking says, "It's a tie between all the Harry Potter movies and Hotel Transylvania." Paired with Spooky Skull Pot Pies. 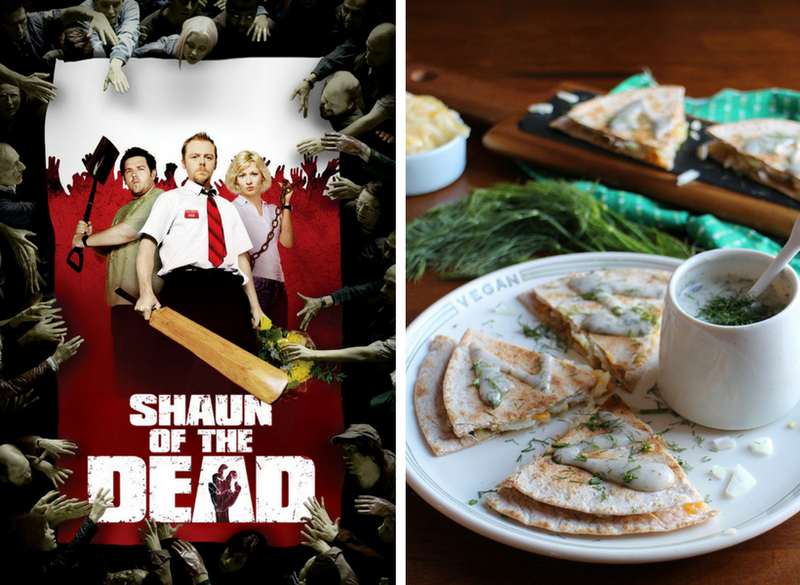 Cadry from Cadry's Kitchen says, "Shaun of the Dead! I can happily watch Simon Pegg in anything, and that crew is hilarious. (If you haven't watched the TV show Spaced, do it!) British comedy + zombies! To eat, we'll have pierogi quesadillas." Another one of my favorites is the Garfield Halloween Special! I used to look forward to it every year when they played it on TV. I loved Garfield comic books when I was a kid, so this was so special to me! 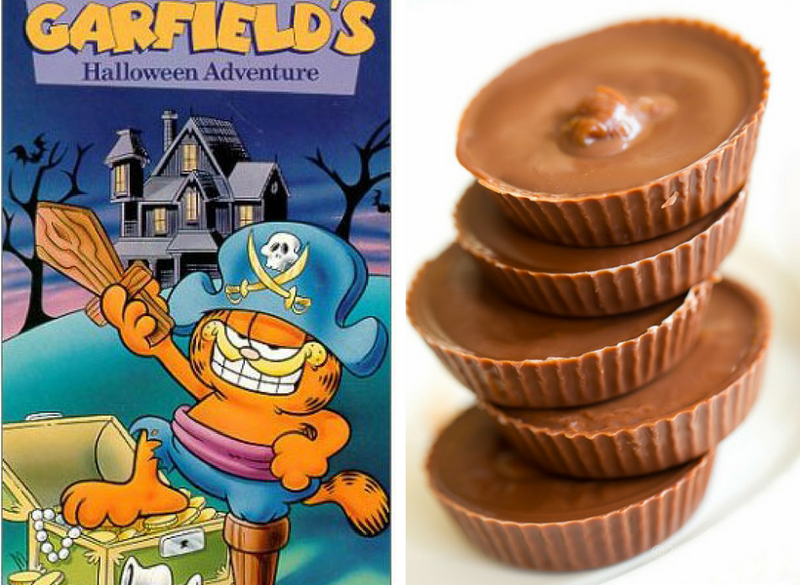 And since Garfield loves candy candy candy, I would serve my Almond Butter or Peanut Butter Cups! 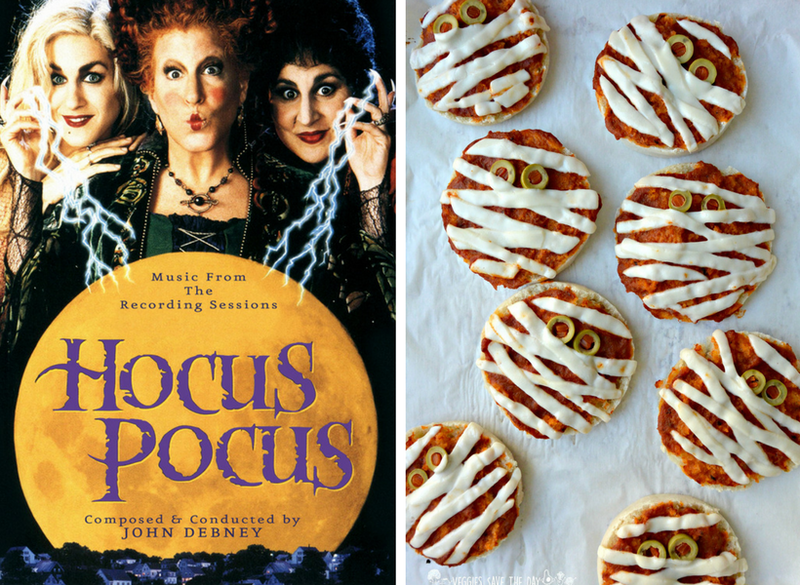 Marina from Yummy Mummy Kitchen says Hocus Pocus paired with a pumpkin hummus platter. 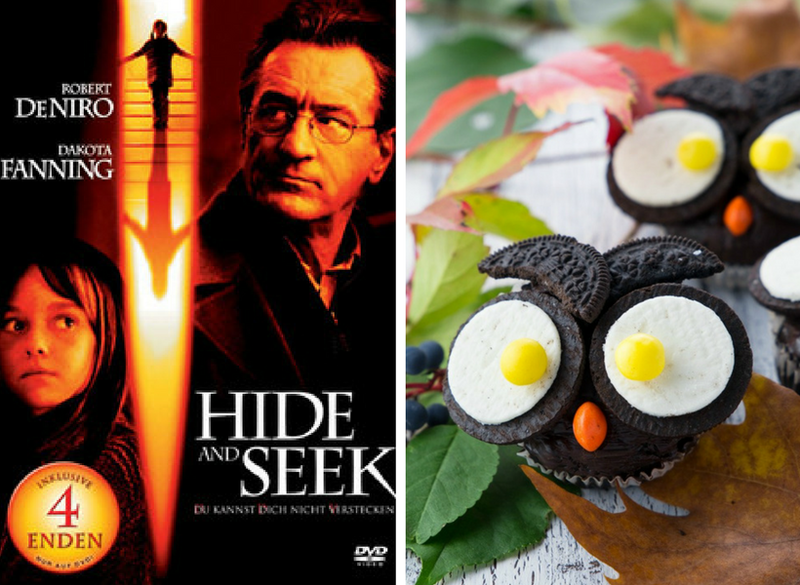 Sina from Vegan Heaven says, "We'd watch Hide and Seek and eat these Halloween owl cupcakes. At least they're not scary." Anjali of Vegetarian Gastronomy says, "Ghostbusters!!! 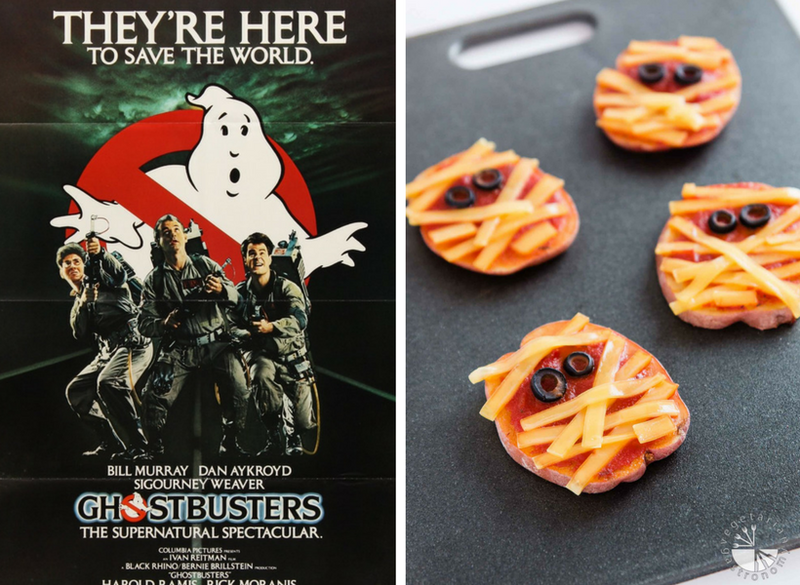 While enjoying these Halloween potato pizza mummies!!" Nicole from Earth Powered Family says, "Harry Potter! 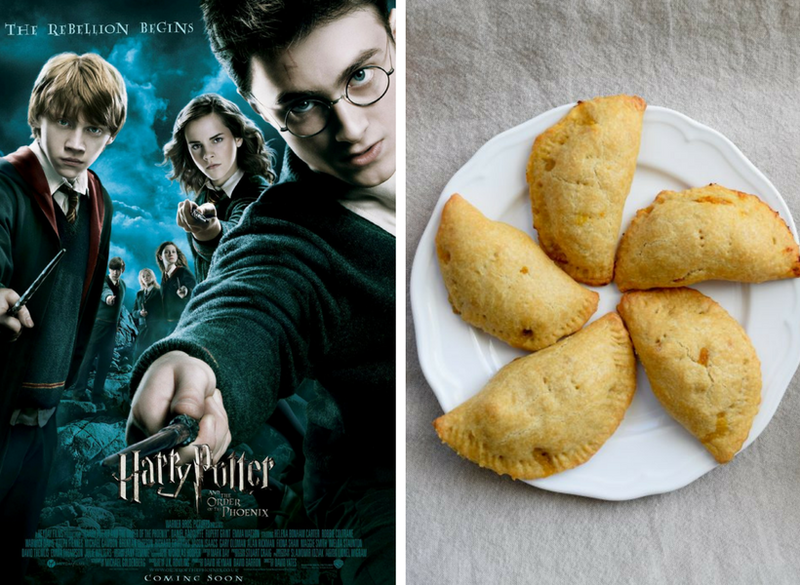 Because every holiday calls for a Harry Potter marathon." Paired with Apple Pumpkin Hand Pies. 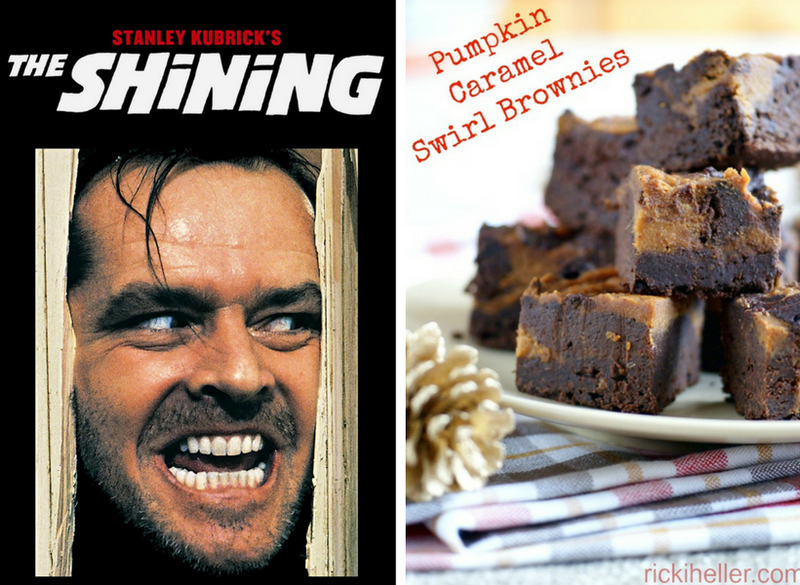 Ricki Heller says, "I'm going to go with The Shining and Pumpkin Caramel Swirl Brownies. Because whoah, Jack Nicholson is creepy!" 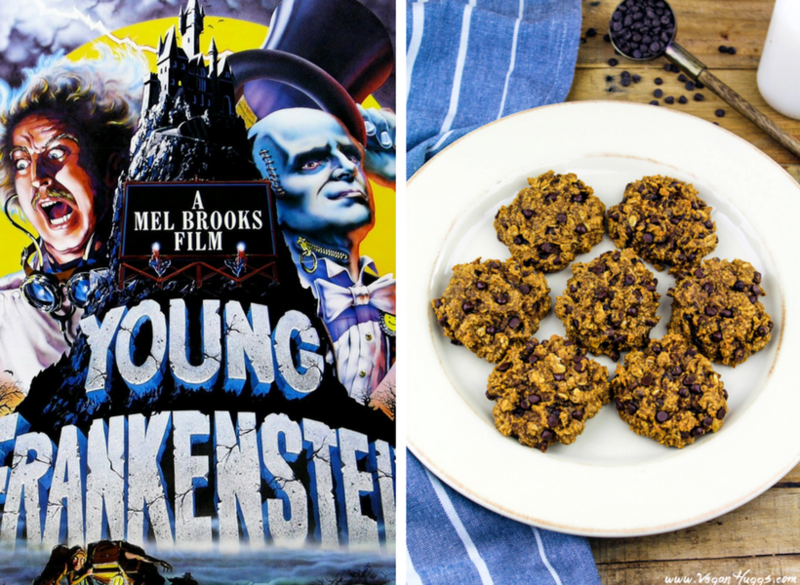 Melissa from Vegan Huggs says, "My favorite movie to watch for Halloween is: Young Frankenstein." Paired with Pumpkin Peanut Butter Chocolate Chip Cookies. 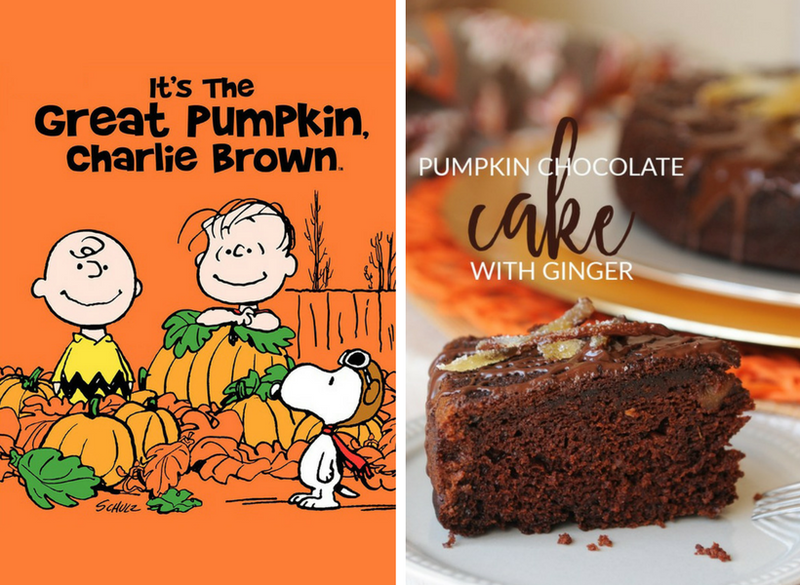 Sarah from Fried Dandelions says, "I would serve my delicious pumpkin chocolate cake, complete with spooky spider web decoration, while watching "It's the Great Pumpkin, Charlie Brown" with my kiddos, ages 2 and 5!" 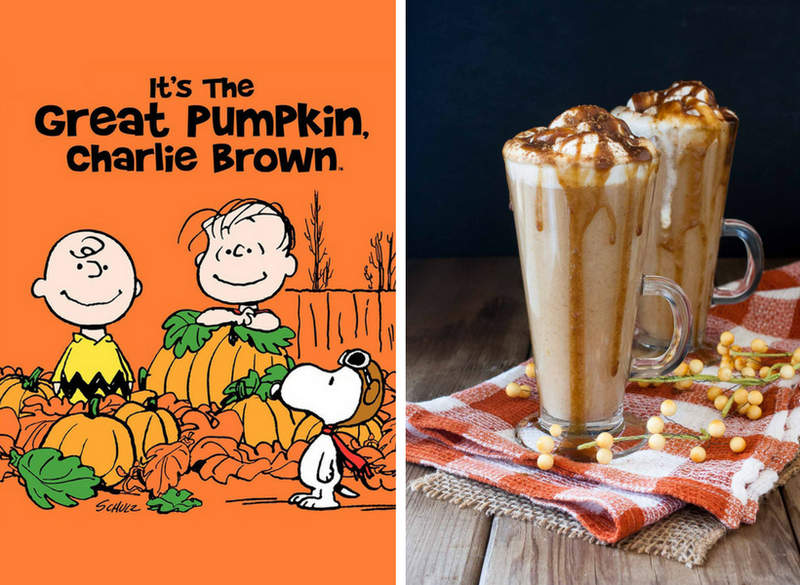 Kelly from Tasting Page says, "The Great Pumpkin Charlie Brown" is one of my favs since I don't like scary movies, and it does well with this!" Paired with Zoodles with Pumpkin Kale Pesto. 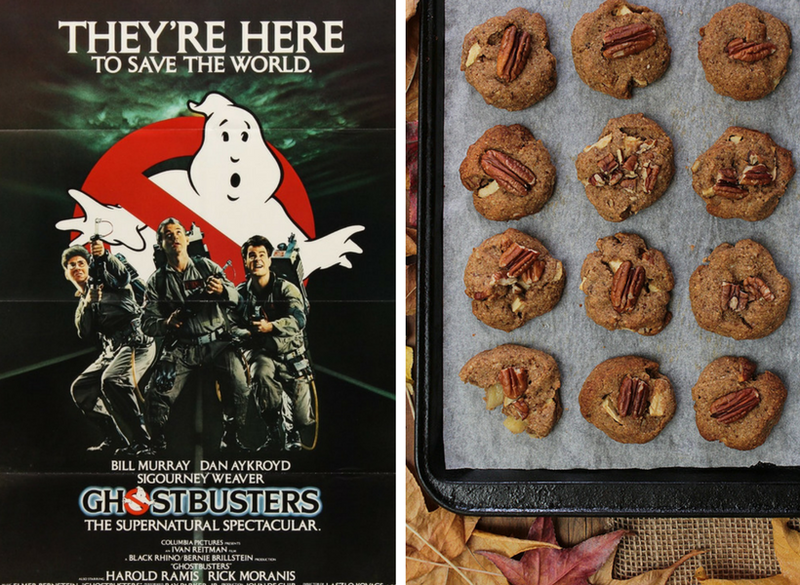 Lauren from Healthy 'n Happy says Ghostbusters with these cookies. 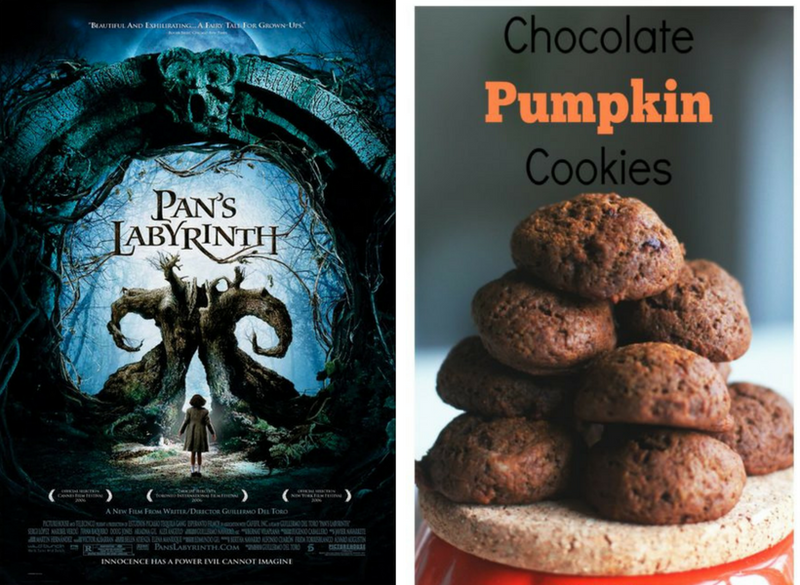 Amy from Fragrant Vanilla Cake says, "I'm not big on scary, so I would go for a cute movie! 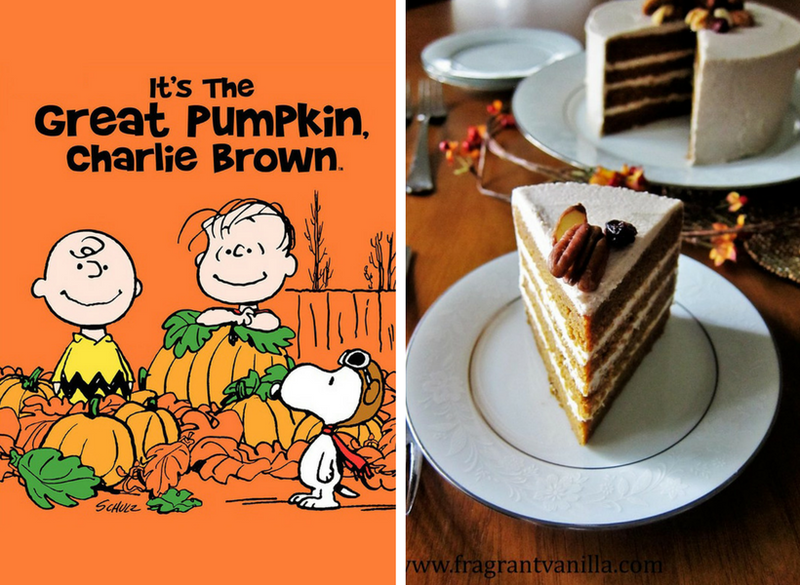 "It's the Great Pumpkin Charlie Brown" and serve my Vegan Pumpkin Spice Cake with Cinnamon Cream Cheese Frosting for dessert!" Lauren from Oatmeal with a Fork says, "The original Halloween! I'd serve these Chocolate Cookie Dough Candy Bars." Lisa from Garlic and Zest says E.T. and these Fluffer Nutter Brownies, not-vegan... Note: Lisa accidentally submitted a non-vegan recipe. 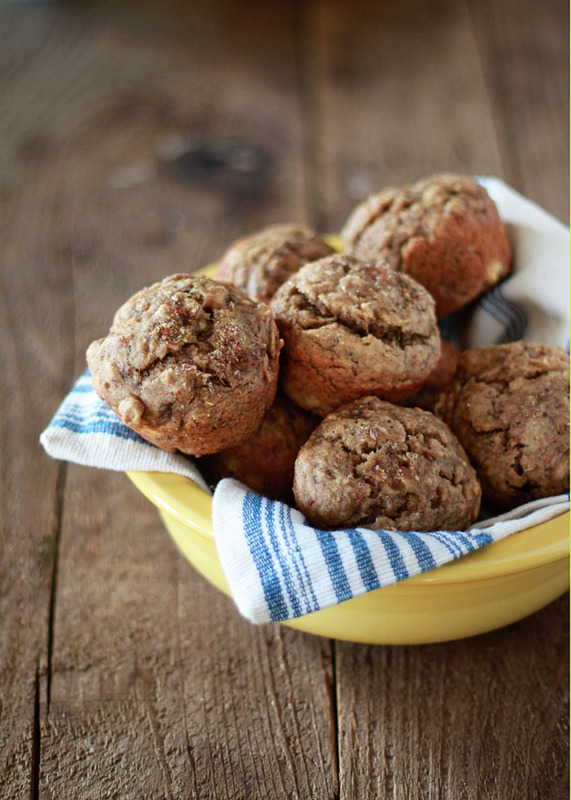 Hopefully you guys can veganize it -- I would simply use vegan versions of everything -- example -- egg replacers like flax eggs or silken tofu. Pumpkin would be an awesome egg replacer for these! 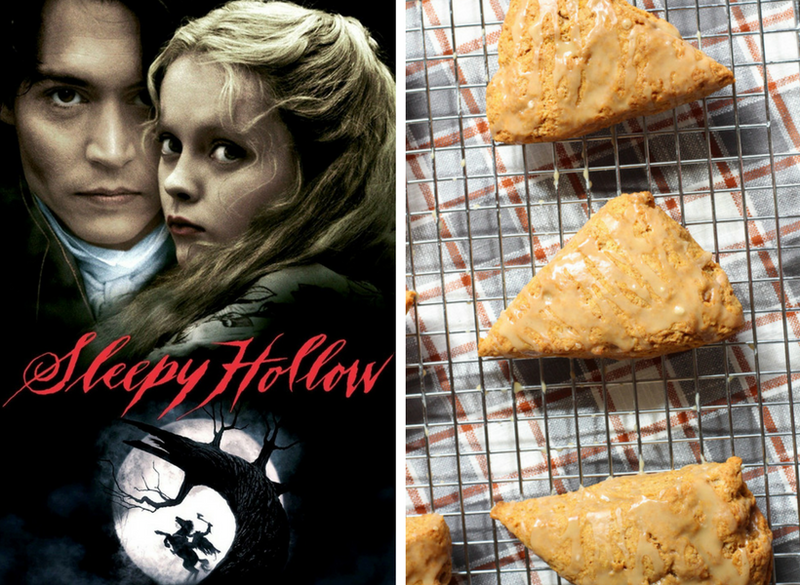 Kristie from The Mostly Vegan says, "Sleepy Hollow with Johnny Depp!" Paired with Pumpkin Maple Spelt Scones. 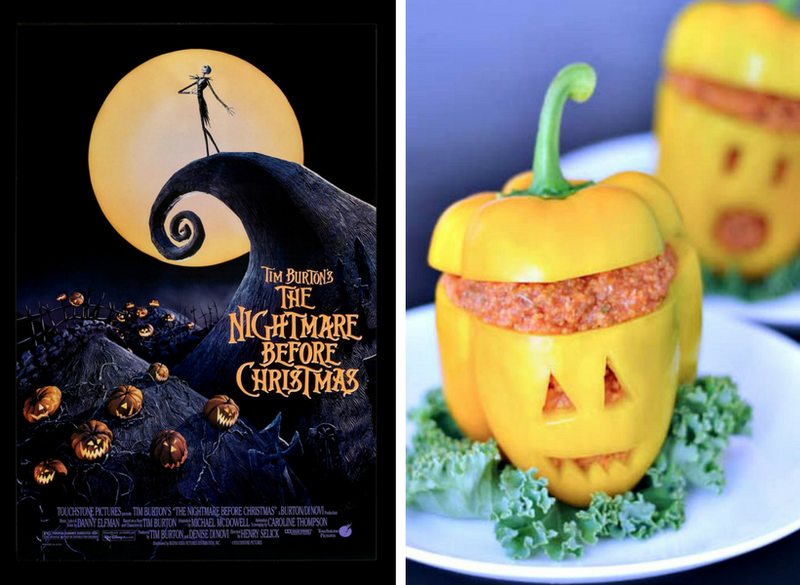 Kristina from Spa Bettie says, "The Nightmare Before Christmas and one of my Pizza Pepper Jacks." Sri from Cook with Kushi says "I love Hocus Pocus!" Paired with Pumpkin Donut Holes. 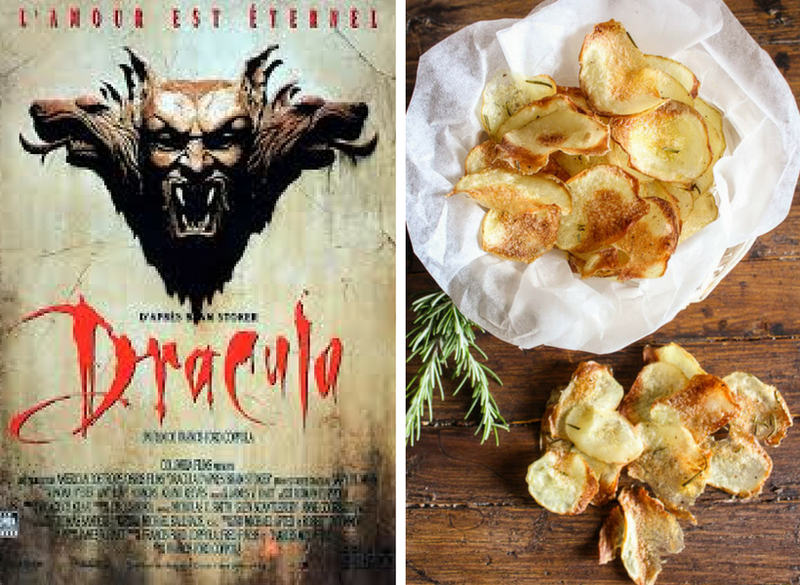 Rosemary from An Italian in my Kitchen says, "I have to go with Dracula and eat lots of Italian Baked Potato Chips." 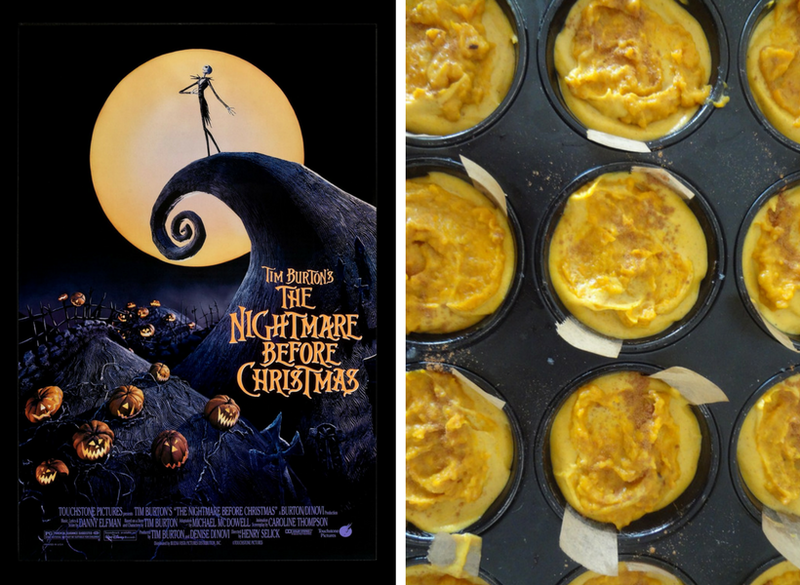 Carolyn from Peacemeal says, "Nightmare before Christmas and these mini pumpkin cheesecakes." Did your favorite Halloween movie make the list?.. disclosure: All 'movie poster' photos are copyright of the movie or TV studios and are used here for promotional purposes. I do not own the rights to any of these images. This post also contains some Amazon affiliate links to those movies.